First hand report of a trek to Vasota: a fort amidst inaccessable backwaters of Koyna Dam now a part of Sahyadri Tiger reserve. Every year I make a resolution. Trekking is foremost. Harischandra and Vasota are two ‘dhams’ for trekking enthusiasts. Add to that list; Ratangad, Rajgad, Bhairi, Rajmachi... there are many such dhams. I had done Rajgad, Torna, Torana Rajgad, Shivthar Rajgad, Khandas-Bhimashankar, Lonavala, Dukes nose, Madhu-Makrandagad, Rayreshwar, umpteen times Sinhagad, but somehow missed these two popular slots. Three years back I went to Harishchandragad. I was impressed by the grandeur of Kokankada, the terrain and surrounding peaks. It was amazing. Last two years were dry in that respect. But the year 2011, is a year of health for me. It began with two climbs to Sinhagad. Solaris my health club has started Transform challenge which led to a lot of activities. I had heard that Vasota fort will no more be accessible for trekkers after the formation of the Koyna Tiger reserve. So I felt that Feb 2011 was my last chance. I trolled the web and found Giridarshan conducting a trek on the 13th. I called few friends and one of them joined. He being a lecturer at Sassoon, roped in four students. Got myself a sack, sleeping bag and headed towards the meeting point in the city at 10:30 p.m. There were many takers for this trek maybe due to the tiger reserve threat. We had two busloads of trekkers heading towards Vasota. After innumerable delays and pickups on route we finally hit the highway at midnight. The night was cold. I caught up with my school mate and shared memories of school, college etc. Had a welcome tea break at Mahabaleshwar phata and reached Satara at 1 am. I don’t know why they halted at Satara for more than 30 mins. Finally we took the Kaas ghat. Kaas plateau in the night is another story. Two buses in total darkness and steep turns can be very scary. Finally we reached Bamnoli at 4 am. With just two hours available for sleep. Found ourselves a corner inside a temple. Spread the sleeping bag. But before crashing, had to meet the most important task during a trek: Cleaning bowels. This task has to be accomplished in open air in the dark. So one by one we trooped off to the lake, alone of course. It’s a scary experience. Having managed that we hit the sack and attempted to sleep amidst the snoring of at least 60 odd trekkers. Funny how you cannot get away from a crowd here too. Next morning brought with it a breakfast of pohas and tea. The ferry guys came in at 9 just like in any govt office. Forest permissions are also granted on the spot contrary to my information that we have to get in advance from Pune. But staying at Vasota is not permitted. If they find you guilty of contravening that rule, there is a penalty to be paid. So off went our fleet of 7 boats with 12 people each around 9:30. 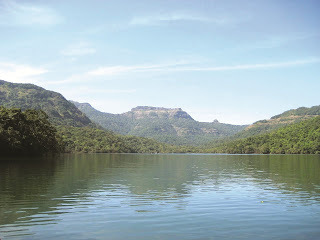 The expanse of the Koyna dam is jaw dropping. From Tapola till the dam wall it is nearly 60-70 km north-south. Add to that the inward stream of lake on both east and west sides. Some of them are as long as 5-6 kms. The standard east-west width is at least 6 -7 kms. This amounts to huge water storage. Still the fact that Maharashtra suffers from power deficit and water crisis in summers is another story. On the west side of dam we have huge jungles and few hamlets cut off from world. shapes, butterflies and birds but did not see any other wild life (fortunately or unfortunately). We saw a cat which people claimed was an udmanjar. The gradient is reasonably steep but not so taxing. Lack of sun makes it easier also the cool breeze. A km ahead you have a natural water stream which is the last water source before the top. The water is amazing. The jungle noises soothe you all along. I pitied those who had their earplugs on with some music. Thankfully inspite of the group being large, chattering was kept to a minimum. After one and half hours of forest climb we reached an open spot from where we could see how far we had travelled and could see jungle, dam waters, and mountains. The view is so amazing words cannot do it justice neither do pictures. The walk on the forest trails is an experience. We reached the fort at 12:30 p.m. There is nothing atop the fort except a water tank , an old dilapidated temple and some basement structures. It seems the Britishers destroyed the fort when they captured it. While they have preserved the silliest of castles in Scotland, they have ruined our forts and history. That is will unpardonable. In fact during the reign of the Marathas, britishers were imprisoned there. Imagine being imprisoned on fort thousands of km away from home that too in such landscape. That is nerve wracking. This fort was captured by Shivaji during the conquest of Javali from the Mores. From then on until the british took over it was always with the Marathas. Thankfully no Mughals or Shahs ruled Vasota. We then we headed towards Babukada which is a steep cliff with a great view. It might be the second tallest rock formation after Kokankada on Karsihchandragad. On its top is Old Vasota which now is very difficult to reach unless you have a guide to show you the way. The view of the Konkan on its west is astounding. Giridarshan had provided us with a lunch of chinese mix veg, roti and shrikhand. It was delicious. Lunches on treks are always great. Machi was next, where we saw the Nageshware cave. It is 3 km ahead and has an old cave and temple. We began the climb down at 3 p.m. and reached the boats by 4.30. Climbing down takes a toll on your knees. But some trekking experience helps. The rolling boat ride put some us to sleep and before we knew it we had reached Bamnoli. It was 6 now. Taking the bus back to Satara saw hunger pangs manifest. Thankfully they had ordered thalis at Rajatadri. We were back in Pune by midnight. Those were 24 hrs of extreme bliss! What will 3g services mean to you.